HAMRO HYOLMO: Melamchi Water Supply Project : What Do you think about this project??? Currently, Melamchi water project is a major problem to Hyolmo Indigeneous People. This project could displace Hyolmo people from their native land and might also have many environmental demirits. The so-called 'Hyolmo Water Project' must be critically re-evaluated with the clear understanding of all its consequences. In a statement by the Asian Development Bank, it mentions that this project will introduce institutional reforms with a view to ensuring sustainability of various services. Nevertheless, their promises and assurances have not come to fruition. The reality of the matter does not equate to the reality of the present conditions. I personally believe that all aspects of cultural practices spring from having a secure land; without it, one would not only lose the mode of expression through wearing a regional dress but would also lose the very cultural identity of which are are proud of. Below you will find the statements provided by the ADB and I humbly request all the readers to go through it and place their honest comments. The Project will improve the health and well-being of the people in Kathmandu Valley by alleviating the critical water stress in the region, where 1 million urban dwellers receive piped water for only two hours every two days. This will be accomplished by tapping additional water resources from the Melamchi River, increasing the water treatment capacity, enhancing access to water, and optimizing the use of existing water resources. The Project will also improve the living conditions of the people in the Project area by mitigating direct and indirect project impacts and channeling benefits to the beneficiaries on a long-term basis, with particular emphasis on social and environmental aspects. The Project will introduce institutional reforms with a view to ensuring sustainability of services. Kathmandu Valley is the country's single largest urban economy and is critical to Nepal's economic growth. Water is central to the well-being of the population and the key to its productive capacities. However, current water services are grossly inadequate and unreliable many people must resort to tankered supplies, bottled water, and both deep and shallow wells. The trend has led to serious environmental concerns as shallow wells are becoming increasingly polluted and deep aquifers are being mined to secure additional water. Poor water quality impacts sharply on public health. (in the dry season) and quality of water, almost all the population suffer, but the effects are greatest on the health of the poor. The Project provides the required opportunity to address both the acute socioeconomic distress caused by the lack of adequate safe water to Kathmandu Valley residents, and the institutional challenges to provide water and wastewater management services on a sustainable basis. The main objectives of the Project are to alleviate the chronic water shortage in Kathmandu Valley on a sustainable, long-term basis, and to improve the health and well-being of its inhabitants. The Project also seeks to develop a comprehensive institutional framework for water resource management within the valley. It involves the transfer of water from the Melamchi Valley into Kathmandu Valley through a diversion scheme with a 26 kilometer tunnel. Good governance, private sector participation, cost recovery, and conservation of natural resources. A summary environmental impact assessment was circulated to the Board on 23 August 2000. Measures to mitigate adverse environmental impacts have been incorporated in the project design. The most critical environmental issue for the people of Melamchi Valley is the amount of water to be taken from the Melamchi River and whether it will affect current irrigation use. A guarantee will be provided that in the dry season a minimum of 30 percent of natural flow will be left in the river. 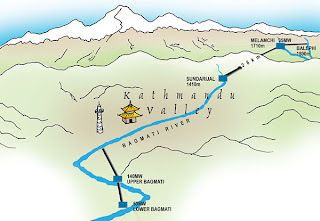 All of the water abstracted will be used after treatment purposes and will not be used for flushing the Bagmati River except in connection with the periodic cleaning of the tunnel. An approved environmental management plan will mitigate against construction impacts through appropriate clauses in the construction contracts. Construction supervision consultants will be responsible for ensuring that contractors follow contract specifications. A final check on compliance with sound environmental practices will be made through an independent assessment by a social and environmental monitoring domestic NGO and the results of the assessment reported to ADB. The location and design of infrastructure has been carefully considered to minimize, if not avoid, land acquisition and resettlement. 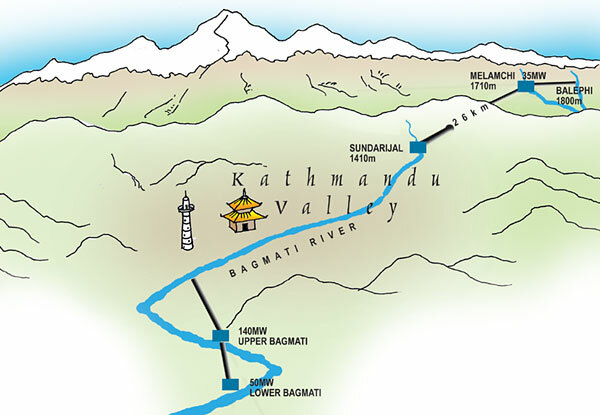 Permanent land acquisition is expected for the Melamchi Diversion Scheme (main access road and access roads to adits), water treatment plant, and bulk distribution system (reservoirs and pipeline route), the distribution network (pipeline route), and the sewerage system improvements amounting to about 131 ha, mostly agricultural land. Temporary land acquisition of 101 ha is also expected for construction camps, borrow pits, and other construction-related activities. Approximately 98 structures of 91 households will be affected either partially or wholly, and about 25 households will be displaced. To ensure smooth operation, the Government has agreed that no civil works contracts will be awarded until all land acquisition is complete. Some community facilities and common property resources will also be affected. Loss of income directly due to the Project will be compensated, and rehabilitation assistance will be provided for severely affected persons. The Resettlement Action Plan developed for the Project and its policy framework were agreed to by MWSDB and ADB. Hygiene education and promotion program will be one of the most important social measures to be taken by the Project for people living in Kathmandu Valley. Special measures are being taken to ensure that the introduction of the private operation of the water supplies will especially benefit the poor. These include access to good quality bottled water, assured connections to piped water, targeted hygiene education and promotion programs, and an affordable tariff based on basic needs consumption and targeted environmental sanitation improvements. The Project's primary target population is the 1.5 million people (180,000 households) living in the Kathmandu Valley. The urban inhabitants will benefit from improved water supply services with better water quality, increased quantity, improved supply, extended service areas, more equitable water distribution, and better customer services. These benefits will go hand in hand with raised public health, hygiene, and environmental awareness, and improved sanitation facilities and maintenance. The Project will also accrue positive socioeconomic and poverty reduction benefits to the Melamchi Valley population (40,000). These will include increased incomes from the expanded market and upgraded skills, reduced workload for women, better education for children, and reduced incidence of trafficking of girls. Date for Consultation : During PPTA implementation, and processing of the Project. Groups Consulted : All stakeholders concerned, including beneficiaries, adversely affected people, village development committees and ward representatives, district development committees and municipal officials and representatives, ministries concerned and MWSDB, the private sector, external funding agencies, NGOs, and consultants. The Project has been prepared with extensive participation of stakeholders, including beneficiaries, adversely affected people, village development committees and ward representatives, district development committees and municipal officials and representatives, ministries concerned and MWSDB, the private sector, external funding agencies, NGOs, and consultants. The Project will address the direct participation of beneficiaries through social uplift program implementation, representation of adversely affected people in the compensation determination committee, and representation of Kathmandu Valley beneficiaries in a water users association. The Project will also undertake consensus building at all levels on issues such as water services, environmental and social mitigation and compensation, and employment. To ensure that women's participation and gender concerns are fully addressed, a gender strategy will be developed and implemented. Apart from this, it has been agreed that at least one of the members of the regulatory body will be female. Procurement of goods and services financed by ADB will be done in accordance with ADB's Guidelines on Procurement. Contracts for civil works estimated to cost more than $1.0 million equivalent will be carried out using international competitive bidding procedures, while those contracts estimated to cost $1.0 million equivalent or less will be under local competitive bidding procedures. Miscellaneous minor goods that cannot be grouped into a larger contract and cost less than $500,000 per contract will be procured through international shopping procedures.